Since the 1960s, a German doctor, Dr. Willmar SCHWABE and French researchers shared a common enthusiasm for a tree that has adapted to the most precarious conditions for over 250 million years of the Ginkgo biloba. Since the beginning of time, this tree has been venerated in China for its extraordinary ability to resist extreme conditions proving its ability to fight off bacteria, urban and industrial pollution. It has even survived the atomic bomb and continues to defeat time. 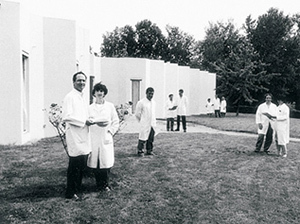 In 1993, A high powered team from the pharmaceutical and skincare industry, FRANCOIS GRANOTIER, Philippe GERBAULT, pharmacist, Christine POELMAN, from the “Facuite de Pharmacie de Paris V” (University of Paris V Pharmacy department) and Luc BENICHOU, in charge of scientific communication, began a collaboration to take a leap forward. BIOSCREEN Laboratories was thus created in 1996 after a great deal of in-depth research carried out on the active principles of the Ginkgo biloba leaf and the discovery of a unique extract: Ginkgo Flavone 40. Following this discovery, BIOSCREEN became the first company to pioneer use of the Gingko Biloba extracts in skincare. The Gingko Flavone 40 extract was the principal active ingredient used in the first 3 BIOSCREEN dermocosmetic treatments that were launched in 1997. Since its foundation, the driving force to continue research on the tree and its benefits have been the search for essential mechanisms that protect, repair and care for your skin and enhance its energy and beauty. Recognition of BIOSCREEN’s innovation came quickly, with the Prix Santé Beauté awarded both in 1999 and 2002 by the cosmetology committee of the esteemed SANTE Magazine in France. It stimulates the synthesis of collagen and reinforces the skin’s support fibers. It captures free radicals, which are the main factors behind cutaneous aging. It regulates cutaneous microcirculation, protects the capillary walls and promotes nourishment in the skin tissues. BIOSCREEN Laboratories have developed a new standardized Ginkgo leaf extract, which is unique in the world: Ginkgo Flavone 40, the only extract, with a 40% flavonoid content, which was exclusively developed for use in dermocosmetic products. It is a genuine plant-based protective screen that is surprisingly effective in protecting and repairing the skin.Perfectly innocuous and highly active even in low concentrations, it is the central and principal natural active ingredient used in all BIOSCREEN products.